On Thanksgiving, Michael Flynn sent a signal that legal experts agreed could only mean he was preparing to cut a plea deal in the Trump-Russia scandal: he had his attorneys terminate the information sharing agreement they’d had in place with Donald Trump’s attorneys. Still, that didn’t mean Flynn actually would cut a deal, only that he was planning to. However, additional developments have surfaced today which confirm Flynn really is going down that path. Michael Flynn’s attorneys have now met with Special Counsel Robert Mueller, according to an ABC News report (link). The only reason for such a meeting is so that the two sides can each share what they have. Mueller’s team will lay out the evidence it has against Flynn, in order to convince him that he really is screwed if he doesn’t cut a deal. In turn, Flynn will lay out the evidence he has against the bigger fish in the Trump-Russia scandal, in what’s called a proffer session, in order to prove to Mueller that he’s worthy of a lenient deal. As Palmer Report explained last night, once a suspect gets as far as holding a proffer session, legally speaking, there’s no going back (link). 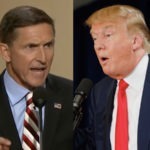 Even if Donald Trump were then able to convince Flynn not to formally agree to a deal, Mueller would still be able to use everything that Flynn said about Trump. In fact, Mueller would be able to indirectly use some of Flynn’s own words against him, thus increasing the odds of Flynn being convicted if he doesn’t cut a deal. So at this point Michael Flynn’s deal is all but inevitable. Donald Trump is clearly panicking, as he brought former campaign adviser James Woolsey to Mar-a-Lago over the weekend to discuss the matter. But Woolsey is a key cooperating witness against Flynn (link), meaning he was likely acting on Mueller’s behalf during the meeting, thus nailing Trump on yet another instance of obstruction of justice.